On 6th February 2012 HM The Queen celebrated 60 years since her accession to the throne on the death of her father King George VI. A new medal was struck to mark the occasion and was awarded under similar guidelines to the 2002 Golden Jubilee medal. Around 465,000 medals were issued. 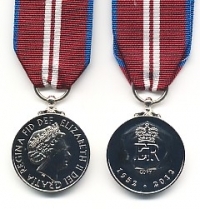 The medal has been approved by the Ministry of Defence Medal Office and has been passed for licensing by MoD IPR.